There is nothing scary about the games, crafts, and activities in this theme which is the perfect follow-up to Halloween! Ask children if they are afraid of monsters. Why? Have them name situations which scare them. Ask them whether monsters exist or not. 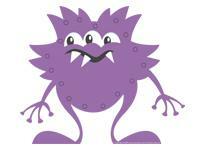 (Open Monster hand prints and footprints) Print and glue throughout the daycare before children arrive at daycare. As children begin to arrive, invite them to walk like monsters, placing their hands on the monster handprints and their feet on the monster footprints. The pictures may be used as a memory game or to spark a conversation with the group. Use them to decorate your daycare or a specific thematic corner. 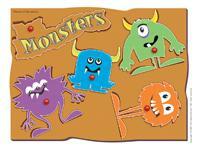 (Open picture game - Monsters) Print, laminate, and store in a "Ziploc" bag or in your thematic bin. Blocks of all kinds can be used to "build" monsters. This is the perfect time to use all the empty cardboard boxes you have collected. They are great for pretend monster houses! Aluminum foil or other metallic papers. Various sizes of empty cardboard boxes can be used to make monsters. Recycled material, scraps of paper, pipe cleaners, etc. Anything you can get your hands on! Monsters are best when they are unique! A collective mural on which each child draws, glues, or crafts his own monster. Finger paint to create a "handmade" monster. Modeling dough which can be left out to dry is great for 3D monsters. Children can paint them. Make monster masks using paper plates. 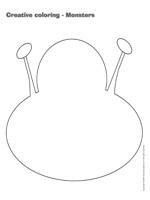 Coloring pages which represent monsters, bizarre creatures, and aliens. Shape stencils which can be used to make monsters. A tent or a very large box (like a box from an appliance) can become a monster house. It can be decorated using garbage bags cut into strips...a little like a Halloween haunted house. You may also add tiny Christmas lights inside. Masks, wigs, clothing items, etc. Children can dress up like monsters. Face paint and a mirror. Let children paint their own monster faces! What does a monster's kitchen look like? Provide Halloween dishes, stimulation bottles filled with strange items which represent spices and other elements found in monster recipes. Memory game involving monsters with the educatall picture game or a store-bought version. Puzzle representing monsters or silly creatures. Modeling dough can be used to make monsters. Let dry and paint. Assembly or gear games to make unique monsters. A storage bin filled with Magnetix pieces to create a magnet monster! Books about monsters and strange creatures. Halloween books are perfect. Add weird puppets or stuffed animals. A monster obstacle course! Include a tunnel, chairs, a parachute...so many things can be transformed to be monster-like. Have children wear a mask or a wig throughout the obstacle course. Dance in the dark. Provide flashlights. Invent your own dance...a monster dance! Fill a container with cooked pasta and a few drops of dishwashing liquid. A dirt or mud bin. Bin filled with colored rice or macaroni. Make your own magic potion: combine several ingredients which do not necessarily go together. Various scientific experiments done by a monster (caregiver dresses up like a monster). Use the flashcards to spark a conversation with the group or in your reading and writing area. They may also be used to identify your thematic bins. (Open word flashcards-Monsters) monster, scared, beast, alien, night, cyclope, ghost, giant, werewolf, vampire, sea monster, creature. Play just like Simon says. Give children various instructions and they must follow them only if you say, "The monster says..." first. If not, they must remain still. Children pretend they are monsters and use cushions for a small pillow fight. Children take large steps and make bizarre sounds. Use musical instruments to make footstep sounds. Hide plastic monsters throughout the daycare. When you are ready, give children the signal. They must find the monsters. Whenever you are walking towards the cloakroom, lunchroom, or bathroom, instead of walking normally, walk backwards! Provide children with several different sizes of boxes. One child is designated to be the monster and the other children must hide from him. The first child to be found becomes the monster. (Open I can create my own monster) Print, laminate, and cut in three parts. Give children the pieces and let them create their own monsters using the various heads, bodies, and feet. They do not have to use matching pieces. (Open dominoes - Monsters) Print, laminate, and cut out the pieces. Show children how to play and have fun! 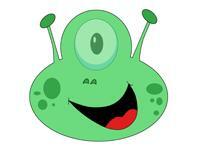 (Open game - Monster eye) Print, laminate, cut out and glue the monster's face to the wall. Give each child one laminated monster eye. Blindfold children and have them take turns attempting to place their monster eye as close to the center of the monster's face as possible. Deposit, in a large space, objects which can represent the places where the monsters hide (under a table, behind a couch, behind a door, etc.) Children must follow your instructions and go to the correct location as fast possible. For example if you say, "The monsters are hiding under the table", children must run and hide under the table. Variation: Depending on the ages of the children in your group, you may also turn the lights off and provide children with flashlights. (Open lacing - Monsters) Print, laminate, and cut out. Let children lace the monsters. (Open picture game - Monsters) Print and glue the pictures to the floor throughout the daycare. Be sure to have one less picture than the number of children who are participating (for 9 children, use 8 pictures). Children walk around the daycare to the sound of music. When the music stops, children must quickly sit on one of the pictures. The child who does not succeed joins you. The game continues until there is only one little monster left. (Open game - Four monsters) Print and glue on an opaque piece of cardboard. Cut out. Place all the cards face down (so you cannot see the monsters). Children take turns throwing a die. Whenever a child rolls a "1", he may turn over a card. He must be the only one to see the card. If he does not already have the card, he can place it in front of him for everyone to see. The game continues. The first player to have collected all four monsters wins. (Open story and memory game - Monsters) Print two copies and cut out the illustrations. Glue them onto the top of frozen juice cans. Attach a magnet to the end of a fishing rod (or a stick with a piece of string attached). Deposit the tops of the frozen juice cans on the floor so that children are unable to see the illustrations. A child picks two illustrations. If they are identical, he keeps them and plays again. If not, his turn is over. (Open models - Finger monsters) Print and let children color them as they wish. Glue them on heavy cardboard. Cut the strips at the bottom of the page and glue them so they form a circle. Children insert their fingers and use them as finger puppets. Make your own monstrous texture. Children will love manipulating it! Combine water and food coloring. Slowly add cornstarch. Do not stir! Using your hands, press the slime until it forms a ball. When you open your hand, the slime will become liquid. (Open craft - Monster) Print. Give each child a green plastic soft drink bottle. Have them color and cut out the various pieces which can be used to create a fantastic monster. (Open craft - Monster masks) Print and deposit in the center of your arts & crafts table. Give each child a paper plate in which you have already cut out holes for the eyes. Let children create their own monster masks. When they are done, add string to tie their masks behind their heads. (Open craft - My little monster) Print for each child. Have children color the pieces and glue them on an empty toilet paper roll. Discuss dreams (good and bad) during circle time. Invite children to talk about their own dreams. Tell them how Amerindians have a legend which involves dreamcatchers. They hang dreamcatchers in windows to prevent bad dreams. Here are the instructions to make dreamcatchers. Use a pipe cleaner. Children thread beads onto the pipe cleaner. They may also add feathers, leather strips, etc. When they are done making their dreamcatcher, they can tie the two ends together to form a circle. Hang with string. (Open craft - Monster hat) Print and place in the center of the table. Roll a sheet of construction paper so it looks like a cone. Attach with tape or staples. If you choose to use staples, you may use adhesive putty to hide the staples. Children decorate their monster hats. (Open creative coloring - Monsters) Print for each child. Invite children to complete the picture by drawing a silly monster face.